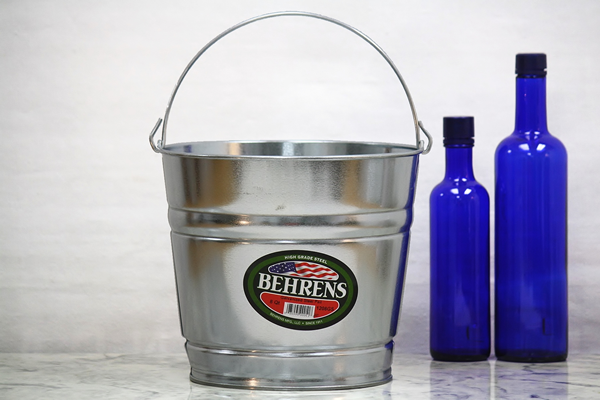 We are pleased to offer this shiny electro-galvanized steel pail with an 8 quart capacity. It is made with a reinforced wire rim, multiple body swedges, durable handle, and offset bottom. These 8 quart galvanized buckets are rust resistant, and can be used to carry chicken feed for countless seasons. They can also be used as delightful barn storage for painting, tiling, or drywall supplies. Whenever you need a timeless decoration or handy organizational tool, turn to these galvanized metal buckets! We also offer this bucket in 10 quart, 12 quart, and 14 quart sizes. See the more-durable 8 quart hot dipped galvanized steel style here. Note: This bucket is not hot dipped and has a shiny finish. They definitely came before I expected! The size is perfect for what I wanted too.